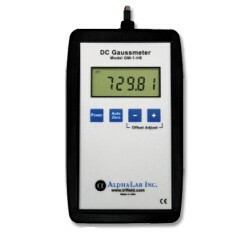 DC Gaussmeter Model GM1-HS - AlphaLab, Inc. 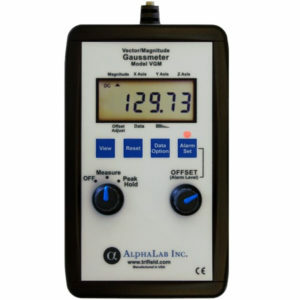 The Model GM1-HS measures the strength and polarity of magnetic fields up to 799.99 gauss. 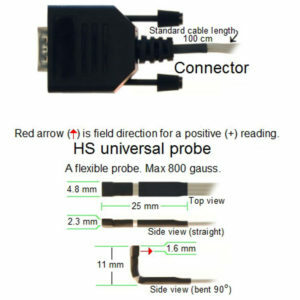 The thin sensor is at the end of a 100 cm flexible cable. The sensor tip is also flexible and can be bent for a variety of situations. 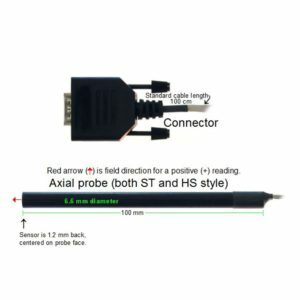 The sensor can be held against the surface of a steel part to check for residual magnetism, or it can be bent into an “L” shape to measure inside a DC Solenoid. 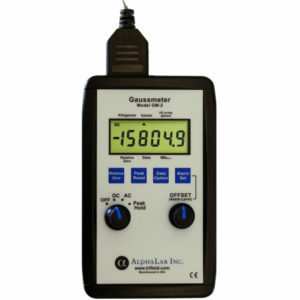 This meter has a resolution of 0.01 gauss (1/50 of the Earth’s typical field) which is finer resolution than the Model GM1-ST. It is also used to map fields from large magnets (If fields are over 800 gauss, use the Model GM1-ST). The meter has immediate turn-on and updates 4 times a second. 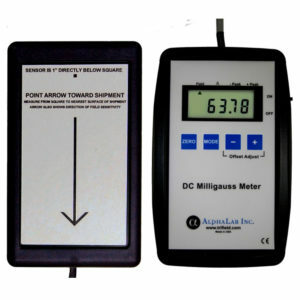 There is no setup required, making this the fastest gaussmeter available. Makes detailed measurement of residual magnetism in metal parts. Use to map field near a magnet, such as the 5 gauss line around an MRI machine. Detect ambient field direction and strength, such as Earth Field.